Mounted on 76cm (30″) stands. At 1.5 meters distance, they are dimmable between 6 and 850 Lux using a single D50 channel, or up to 2500 Lux using all three fluorescent channels (CWF,D50,D65). A 415 : 1 ratio of output levels. A 430:1 ratio of output levels. 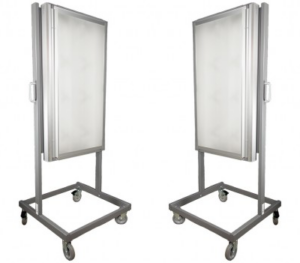 40″ x 60″ reflective chart area: uniformity >80%. Smaller reflective chart area: uniformity >90%. Dimensions – Tall lights that are vertically mounted work best. The aspect ratio of your lighting system will affect uniformity.Vertical orientation will keep light levels consistent from the bottom to the top of the test chart. Illuminants – Different kinds of light sources have different spectral distributions. While the world switches over to LED lighting, a comprehensive test plan will include testing under fluorescent and incandescent illuminants. CIE Standard illuminants are defined by their spectral power distribution. Standard illuminants provide a basis for comparing images or colors recorded under specific lighting conditions. LED and fluorescent bulbs approximate the actual CIE illuminants, but contain much less near-infrared (NIR; >730nm) energy than actual daylight. For silicon-sensor cameras with near-infrared cutoff filters this is less of a concern. Color temperature – Color temperature is defined by the Kelvin (K) value of ideal blackbody radiation. Color temperatures over 5000 K appear cool, or bluish white. Lower color temperatures (2700–3000K) appear warm, or yellowish white through red. Light output – The range of Illuminance range can be characterized by the maximum and minimum lux values that a lighting system can produce on a target at a specified distance using a particular illuminant. Dimming ratio is an indicator of how wide a range of conditions you can simulate in your lab. The practical light intensity will depend on the specific test environment and light system configuration. Enabling multiple illuminants, moving the lights closer and multi-light configurations can yield significantly brighter levels. Enabling multiple illuminants, moving the lights closer and multi-light configurations can yield significantly brighter levels. Adding neutral density filters can yield much lower light levels. Please contact us for more details and advanced configurations. Uniformity – Uniformity is defined by the variation of light intensity across the target area. There should be a luminaire placed on either side of the camera to avoid reflections on the chart and so that the falloff in light level from one light alignts with the increase in light level from the other light. Use a light meter to check for the evenness of lighting. ±20% over the entire target is sufficient for SFR and Distortion measurements. ±5% or better should be the goal for tonal and color measurements (Stepchart, Colorcheck, and Multicharts). Lighting uniformity is strongly affected by the distance and orientation of the lamps. 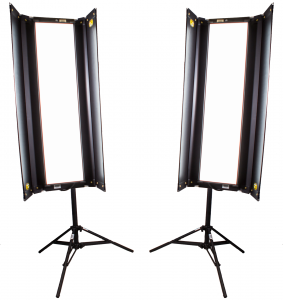 Barn doors – Barn doors shape the beam of light from the fixture, and prevent scattering light from spilling directly into the lens of your imaging system. Barn doors reduce glare, creating more reliable image quality measurements. Control – Lighting systems with automatic control allows for quickly repeatable testing procedures. Eliminating manual tuning of lighting conditions will increase the productivity of camera testing development.